Solid entry-level tablet? 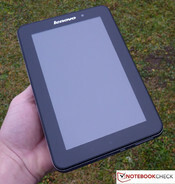 The new Lenovo IdeaPad Tablet A1 was announced a long time ago but it was first available at the beginning of December. The A1 is a 7 inch entry-level tablet and is currently sold for €199 RRP. Is it just an oversized smartphone (without phone functions) or an undersized tablet? How Lenovo's new "penny pincher" fares will be rated based on our conclusive test criteria in the following review. Lenovo Ideapad A1: Solid entry-level tablet with surprises? Until now, Lenovo only has had two 10.1 inch tablets in its range: The Thinkpad Tablet and the Ideapad K1. To expand the selection for the customer, and to close the gap where necessary, Lenovo now launches a new tablet onto the market. Lenovo's product presentation of the IdeaPad A1 states "engineered for enjoyment". Can the 7 inch - thus fairly small - screen really provide "enjoyment" and is the installed hardware convincing? How the tablet fares in everyday use and in our assessments can be read, as usual, in the following detailed review. IdeaPad A1 from above with power button and 3.5 mm jack. The first hands-on with the device conveys an impression of quality and stability - for this price range. The (exchangeable) back cover is made of plastic and has a high gloss look ala piano lacquer. The back cover is available in black, white, blue and pink. The edge between the back cover and touch surface let us first assume metal, but it soon becomes clear that this is deceiving: The silver edge is also plastic. A vast number of fingerprints becomes evident on the glossy screen and on the flip side after a short period of use. A microfiber cloth should always be at hand, but Lenovo doesn't include one in its scope of delivery. We are accustomed to consistently good quality from Lenovo. But Lenovo drops below the €200 mark for the first time with one of its tablets. Neither the Ideapad K1 nor the Thinkpad Tablet is available for so little money. However, the IdeaPad A1 won't disappoint the buyer. The use of plastic is ultimately beneficial for the weight of 400 grams. The somewhat heavier Blackberry Playbook weighs 430 grams and the Motorola Xoom even weighs 730 grams because of the metal cover. In contrast, the currently largest smartphone, Samsung's Galaxy Note N7000, weighs 178 grams with a 5.3" screen. 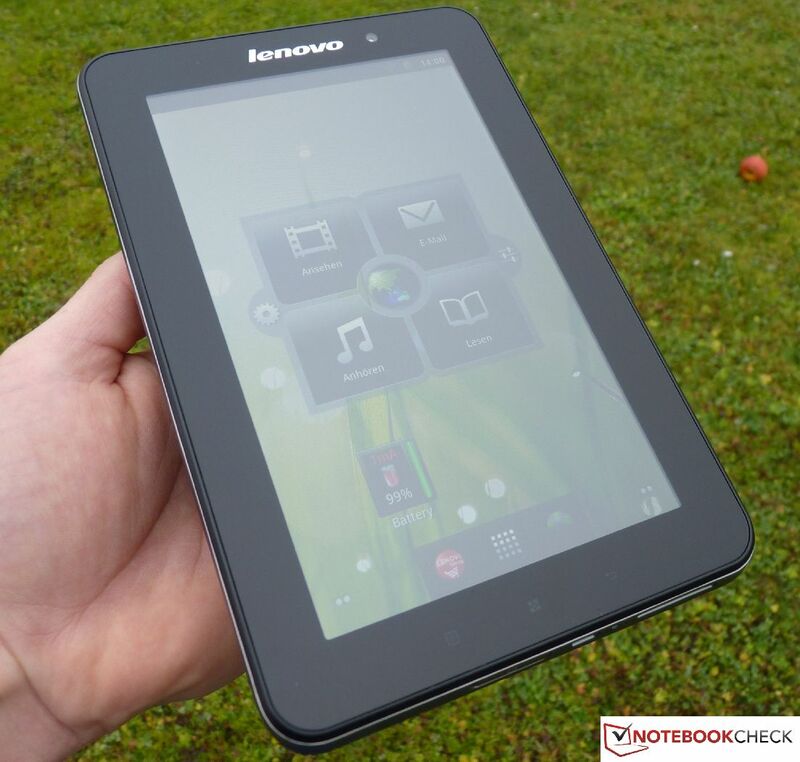 Lenovo has managed to give the tablet a feeling of quality despite a lot of polymer. We can't find any irregularly sized gaps anywhere. Moreover, it is extremely rigid and pressure resistant. The IdeaPad A1 comes with few interfaces. It is somewhat disappointing at first that Lenovo hasn't built in a HDMI port. However, it becomes obvious that the manufacturer has omitted it on purpose in the performance tests. There is a mini USB port and a micro SD card reader, which is additionally protected by a flap, at the bottom. A micro SD isn't included in the scope of delivery. The mini USB port is used for connecting the device as a removable drive and for charging the battery. The integration as a removable drive works without problems with Windows 7 64 bit/32 bit. An additional LED shows the micro USB port's activity. The device's only speaker is found on its right. The volume control, designed as a rocker, is on the case's right. A slider is located above that is to prevent automatic rotation during use in landscape or portrait mode. 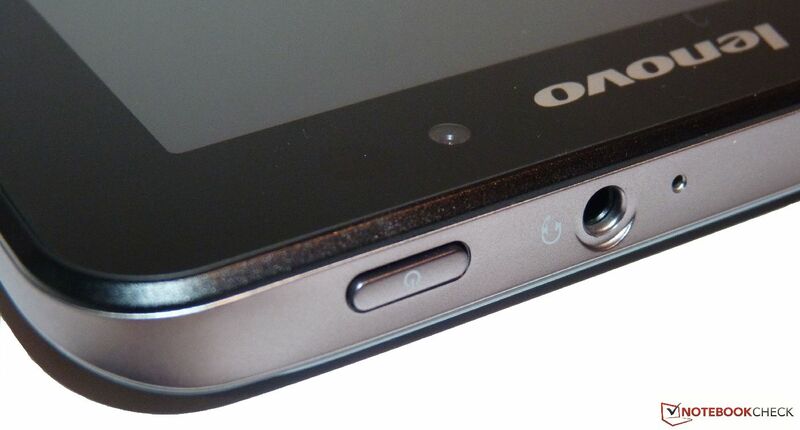 The power button as well as the 3.5 mm jack for audio out is located at the top. All connections make a solid impression; the volume rocker's pressure point is very pleasant. It is noticed negatively that the connected USB charging cable doesn't fit tight in the port. Both cameras installed in the IdeaPad A1 aren't anything special anymore nowadays. However, the front camera is only equipped with 0.3 megapixels, like used by many other manufacturers in their tablets. Examples would be the Sony Tablet S or Tablet P as well as the iPad 2. The main camera has a resolution of 3 megapixels, but this camera doesn't have a flash. Looking at the test pictures taken with the main camera (flip side), moderate ambient light conditions cause high image noise. 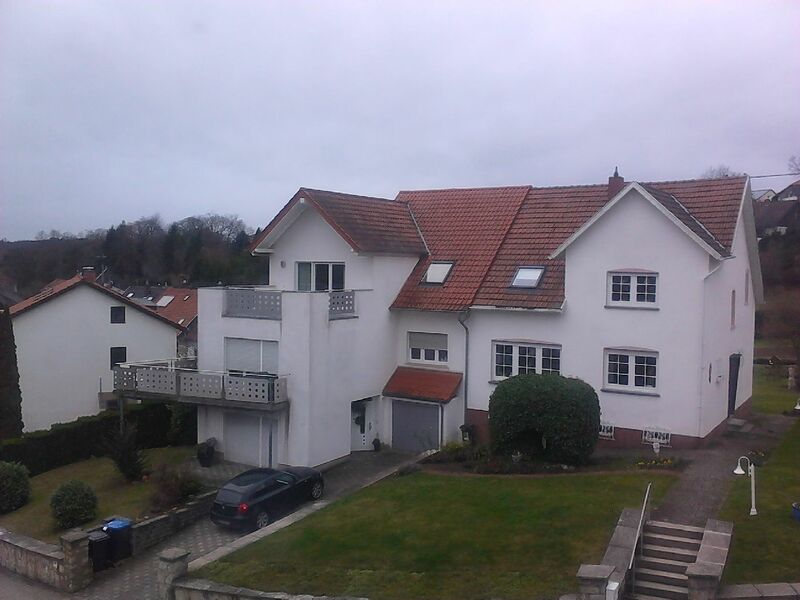 The pictures taken in daylight with the camera are satisfactory in view of the megapixels and the price. The IdeaPad A1's main camera is adequate for taking occasional snapshots when there's no compact digital camera, or even a DSLR at hand. The IdeaPad A1 comes with WLAN 802.11 b/g/n, Bluetooth and GPS as communication features. No model currently has a UMTS module. We didn't notice any connection interferences in the test. Connecting to the home network also worked without ado. The scope of delivery isn't exactly lush. A power cable (110 V adapter to USB), the USB charging and data cable, as well as a short instruction manual and a warranty card are included. Lenovo grants a 12 month warranty. The manufacturer doesn't offer any warranty extensions. Lenovo has installed an additional keyboard besides the standard Android keyboard. It can also be found in the App bundle "Go Launcher" on the Android market. 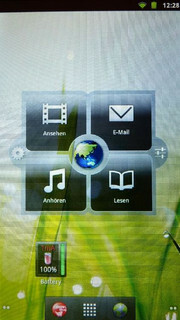 The home screen has been modified and can be compared with that of the Ideapad K1. However, the IdeaPad A1 runs on Android 2.3.4. Typing proves to be pleasant on the IdeaPad A1 in both landscape and portrait mode. All buttons are very easy to use due to the small build of 7 inches. Compared to a 10.1 inch behemoth like the Samsung Galaxy Tab 10.1, using the keyboard is more pleasant because the buttons don't have such a wide gap between them. The screen responds sufficiently fast for nimble-fingered typists. However, stutters and delays are noticed when using the menu and swiping between the home screens. 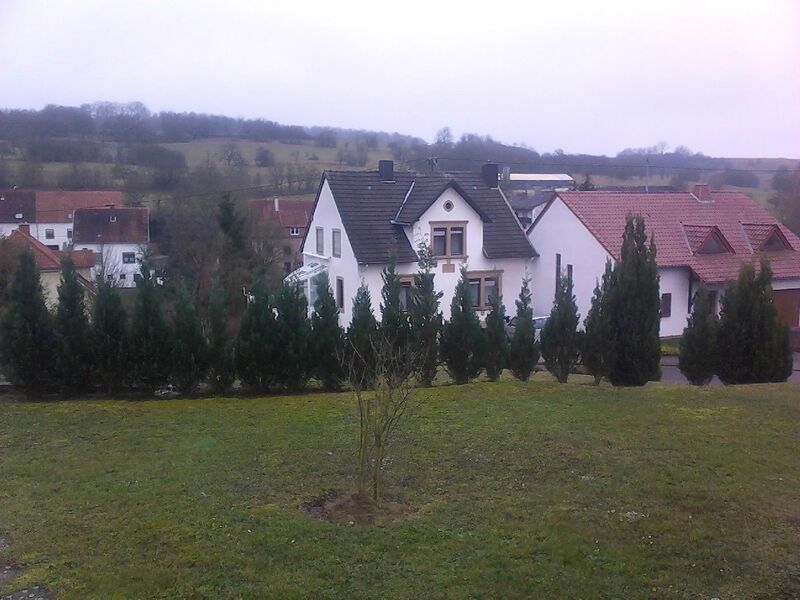 The motion sensor responds adequately, in view of the software, and changes after about one second from portrait to landscape mode and vice versa. The light sensor adapts the screen brightness well and quickly. The menu keys for "Home", "Settings" and "Return" give reason for complaint. The keys only light up for two seconds after they are touched. After this time, the light is turned off. 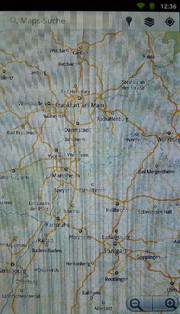 It is very difficult to hit the right button in poor lighting conditions until a feel for their location has developed. When a button is struck, it responds well. The capacitive touchscreen responds accurately and is pleasant to use. The HD screen has an aspect ratio of 16:10 and can only be used with two fingers in multi-touch mode. It has a resolution of 1024x600 pixels (WSVAG). 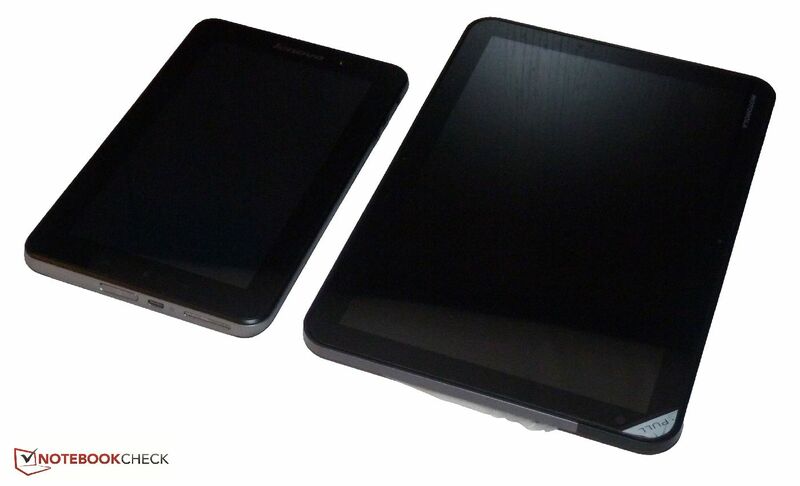 In comparison: A 10.1 inch tablet usually has 1280x800 pixels. The screen's maximum brightness is sufficient for indoor use. Contents are well legible. The Lenovo IdeaPad A1 is examined extensively with the precision tool and luminance meter, Gossen Mavo Monitor, in the measurement lab. In our 9 zone luminosity measurement, we determine a maximum of 208 cd/m2 in the center when the screen is set to its highest brightness level. We measure a maximum black value of 0.32 cd/m2. 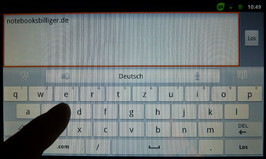 The contrast of our touchscreen is 650:1 and beats, for example, the Prestigio Multipad PMP5080B with a contrast of 421:1. 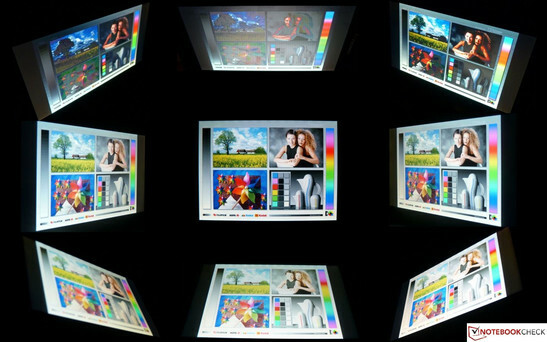 The average brightness of the Multipad PMP5080B is 174.5 cd/m2 and has an illumination of 75%. The IdeaPad A1 (185.6 cd/m2) can score here, but it doesn't stand a chance when compared with more expensive tablets that have at least 350 cd/m2 (e. g. Sony Tablet P). 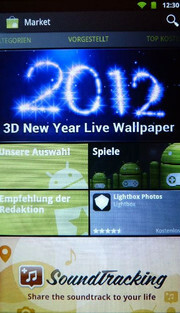 Consequently, the display's rating is also fairly low (64%). We are both surprised and satisfied with the test device's contrast. The tablet is about on a par with contenders of this price-performance range. Naturally, the maximum and average screen brightness can't and shouldn't be compared with screens from a higher price range. 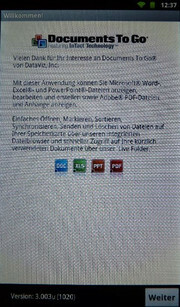 For example, the Blackberry Playbook achieves a maximum screen brightness of 500 cd/m2 and an average brightness of 491.3 cd/m2. This is only a dream for current tablets around €200. However, like many current tablets, it has major problems with readability of content in sunlight, but not only because the display is reflective (glossy). The screen's brightness also makes outdoor use difficult. A bit of concentration is necessary to read the content, and the viewing angles have to be readjusted frequently so that everything remains visible and legible. The viewing angles are stable from a lateral point of view (left and right). However, the colors fade a bit. Content becomes difficult to recognize at an angle of about 45° up or down. Moreover, the colors fade very evidently. 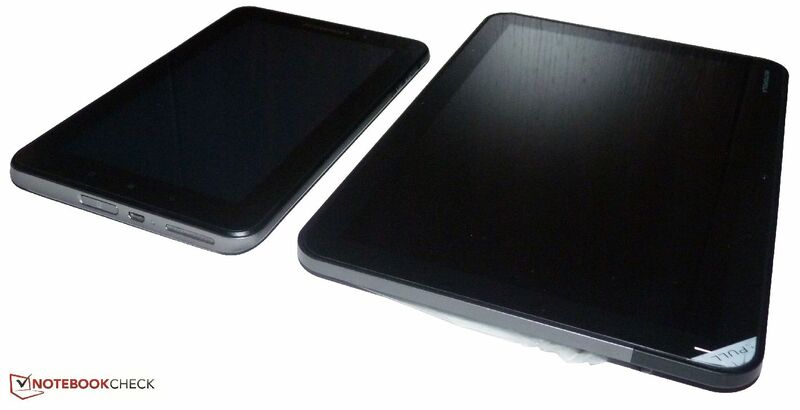 Since the Lenovo IdeaPad A1 doesn't have an IPS screen (iPad 2, Samsung Galaxy Tab 10.1, Motorola Xoom), the color quality and the visibility of the content is very dependent on the respective viewing angle, as can be seen in the following picture. The ARM Cortex-A8 (1.0 GHz) single core processor works together with a 512 MB LP DDR RAM and Nvidia graphics chip. This processor is currently often found in tablets such as the Archos 101 Internet Tablet, Archos 70 Internet Tablet, as well as in many smartphones. However, high expectations shouldn't be placed on this hardware combination. 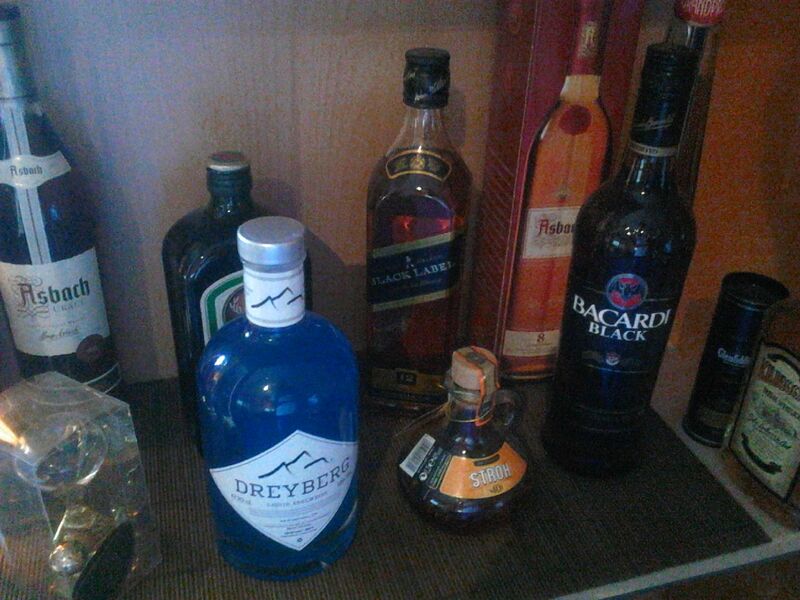 The memory capacity is small and soon finds its limits in various applications. The one or other reason for complaint can be found during normal use. For example, the IdeaPad A1 needs a second before the first sign of activity is seen on the display when the power button is pressed when it's in sleep mode. Stutters are noticed when scrolling in the menu and when swiping through the home screens. Some apps are also opened with a slight delay. These delays could be fixed with the upcoming updates, so we will wait and see if Lenovo surprises us. The following rates are determined with the Linpack benchmark in the single thread run: The IdeaPad A1 finishes the test with 16912 MFLOPs and requires 4.96 seconds. 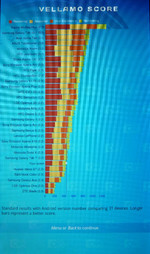 In contrast, the Motorola Xoom clearly has the lead with 28515 MFLOPS and 2.94 seconds. The 10.1 inch Motorola Xoom tablet works with an Nvidia Tegra 2 processor, which is clocked with 1 GHz. 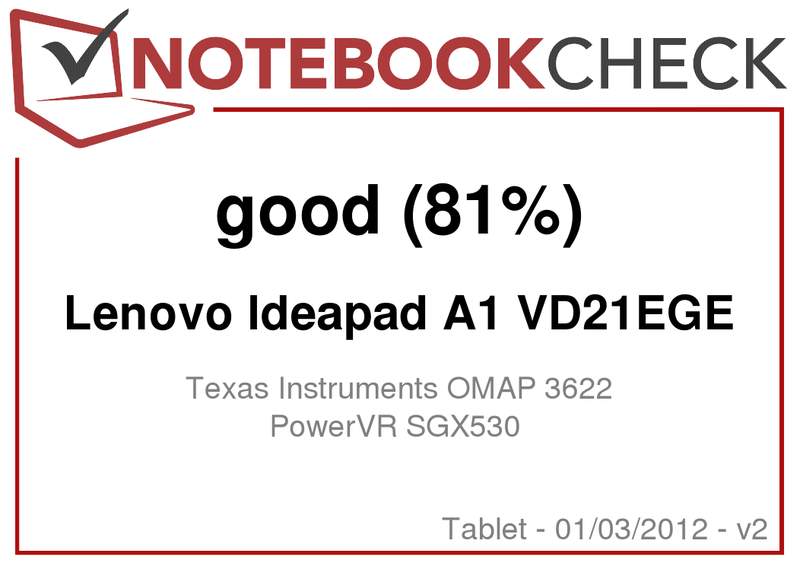 The Lenovo IdeaPad A1 scores a total of 1372 points in the Quadrant benchmark (standard edition). 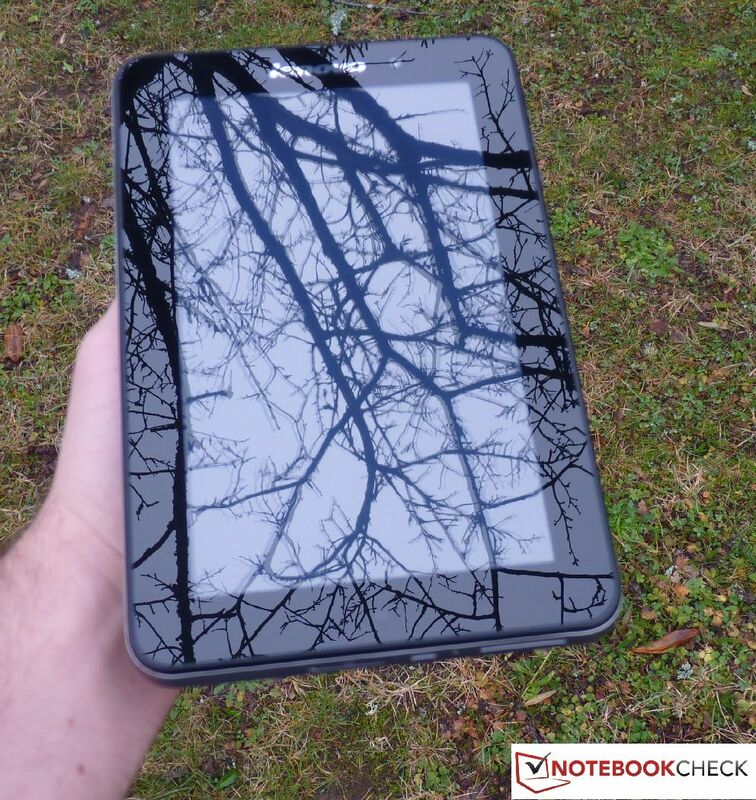 The stronger Motorola Xoom is again much better and achieves a score of 2107. The smartphone, Google Nexus One, achieves a total score of 1300 points and is almost on a par with our test model. The Google Nexus One is equipped with a Qualcomm QSD8250 chipset and an ARM Cortex A8 1 GHz processor. Alike the test device, the Nexus One has a RAM capacity of 512 MB. The IdeaPad A1 reaches a productivity index of 735 and a games index of 1686 in Smartbench 2011. 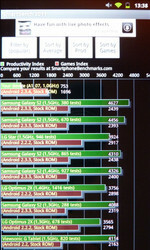 The Motorola Xoom manages a productivity index of 2794 points and a games index of 1576 points. 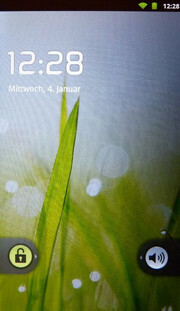 The Samsung Galaxy S2 was also used for comparison. It works with an Exynos 4210 chipset and has a dual core ARM Cortex A9 processor with a clock of 1.2 GHz and a 1024 MB RAM. 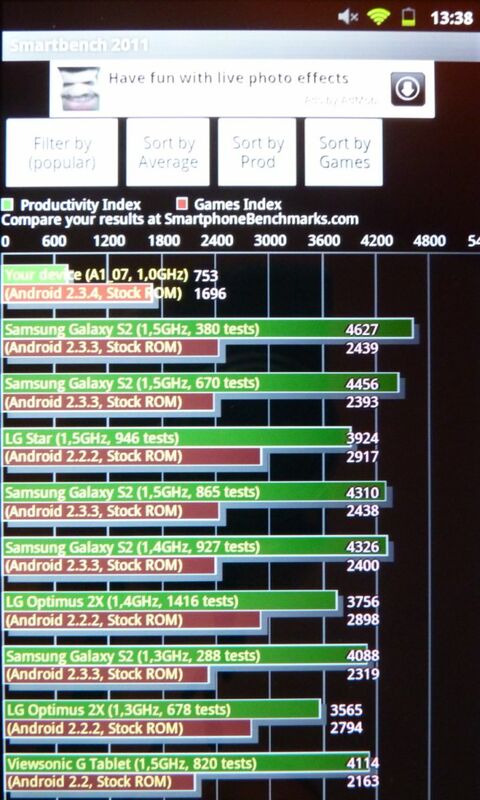 The Galaxy S2's productivity index is 3862 and the games index is 2244 points. Our test device achieves 420 points in our last benchmark, Vellamo Score. 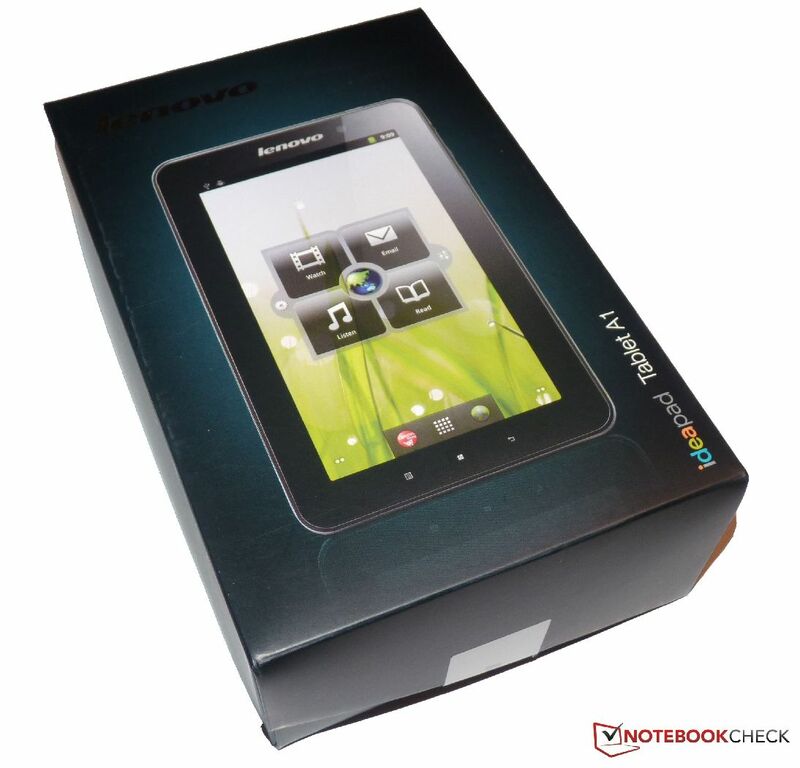 For comparison, the Motorola Xoom reaches 785 points and the Samsung Galaxy Tab 10.1 manages 900 points. Both the Galaxy Tab 10.1 and the Xoom tablet are equipped with Nvidia's Tegra 2 chip and have a processor clock of 1 GHz with a 1024 MB memory. It has to be considered that the IdeaPad and Google Nexus One have the weakest hardware configuration when looking at the results of all executed tests and the device comparisons. The score difference becomes very evident in Vellamo Score and Smartbench 2011 and shows that the 10 inch tablets and their installed hardware play in a completely different league. 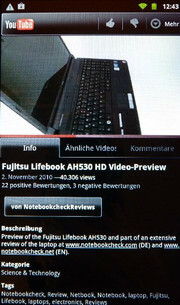 After installing Flash Player manually from the Android Market, we tested how well Youtube HD videos can be rendered. We used the Android browser that is installed ex-factory for this and played the HD trailer from Transformers III. Rendering in 1080p is extremely jerky. It's not possible to watch the trailer. The trailer can be played smoothly for the most part in the quality setting 720p. That is providing an adequate Internet connection is available. As mentioned in the section "connectivity", the insufficient graphics performance for HD movies will be one reason why Lenovo hasn't installed a HDMI port. It's also not possible to play a 720 p HD movie smoothly from an SD card. Movies with a higher resolution (1080p) don't fit on the FAT32 formatted SD card due to their maximum file size. The card reader can also only deal with a FAT32 file system. Games are just as available for the IdeaPad A1 as for other Android tablets, which use the Android Market. For example, we tested "Angry Birds" and didn't notice any problems. Since no mechanically working electronic components have been built into the Lenovo IdeaPad A1, it works noiselessly. We notice that the tablet's right lower back area is warmer than other areas after longer use. This lets us assume that the processor is located here. However, the temperature isn't in a critical or disagreeable range. We determined an average temperature of 24.8°C during load and on the device's flip side with our thermometer. (+) The average temperature for the upper side under maximal load is 23 °C / 73 F, compared to the average of 30.7 °C / 87 F for the devices in the class Tablet. (+) The maximum temperature on the upper side is 26.8 °C / 80 F, compared to the average of 34.8 °C / 95 F, ranging from 22.2 to 51.8 °C for the class Tablet. (+) In idle usage, the average temperature for the upper side is 22.3 °C / 72 F, compared to the device average of 30.7 °C / 87 F.
Generally, many subjective impressions can be made about the sound quality of speakers, and the IdeaPad A1 is no exception. We have to primarily mention that the IdeaPad A1 only has one speaker, so only mono sound is available. The sound is thin and the trebles are overdriven. The result is adequate for the speaker size and price range. However, a headphone should be used for listening to music or watching a movie. We use a voltmeter at the power adapter of the IdeaPad to measure the power consumption. The battery was fully charged for all measurements (can't be taken out of the case). The 7 inch tablet only consumes 1.4 to 3.8 watts in idle. The load power consumption of 4.3 watts corresponds to other 7 inch devices: Acer Iconia Tab A100 (4.8W), Prestigio Multipad PMP5080B (4W). The comparatively low standby consumption of 0.6 watts is significant for practical use. Devices, such as the Dell Streak 7", drain 0.8 watts out of the power outlet (measurement), respectively battery. The manufacturer states a battery life of up to seven hours when surfing on the Internet. The device achieves a maximum runtime of 12 hours and 24 minutes in a mode with the lowest screen brightness, enabled screen and disabled communication modules (WLAN, Bluetooth). The IdeaPad A1 needs 3:15 hours for recharging a completely drained battery to full capacity (connected to the power outlet). A maximum CPU and GPU load is simulated by the app "Stability Test". This test represents extreme use. The communication interfaces are also enabled for this. The screen brightness remains at the highest level and the screen is permanently on. We achieve a runtime of 3 hours and 35 minutes before the device turns itself off in this test. We measure an operating time of 5 hours and 8 minutes in moderate use with diverse applications, such as gaming for 60 minutes, watching a video for 30 minutes and surfing for 2 hours. This last scenario represents the most realistic use. 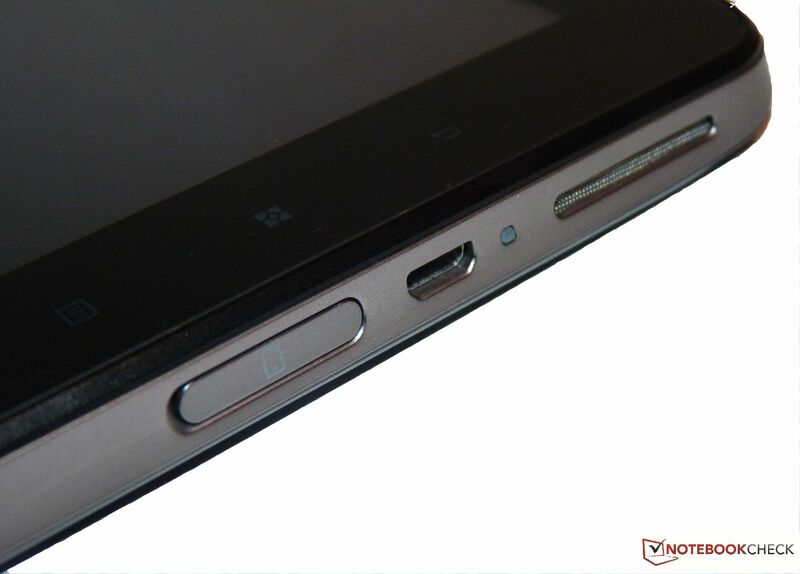 Summarizing, we can say the Lenovo offers a solidly manufactured device with the IdeaPad A1. The device is adequate for surfing on the Internet, watching a little video (no Full HD material) and playing an occasional game and it fulfills its purpose. The tablet doesn't have a HDMI port since it can't ensure a smooth playback of such contents. Slight jerking is noticed in everyday, routine use. The screen has a good average brightness for indoor use and a pleasant feel to the greatest extent. No one can expect high-end hardware for €199; the IdeaPad A1 relies on the good "Lenovo workmanship" and a proper screen. We can only hope that Lenovo will have an upgrade to even out the one or other weakness and that scrolling in the menu or on the home screen, for example, becomes more pleasant. The competition on the tablet market is great and there is currently a big contender available overseas: The Amazon Kindle Fire. How this much talked about tablet fares in daily use can soon be read in a review from our US colleagues. "Documents to Go" is also included. 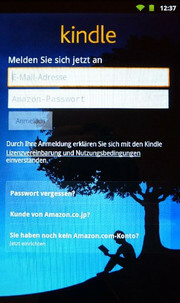 Amazon Kindle, with a vast e-book selection, is also installed. and "Angry Birds" - a real classic. 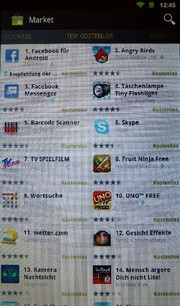 Free apps from the gaming are the popular "Drag Race"
here a small excerpt of free apps. but the home screen launcher is modified. the micro USB port, an LED charge state indicator and the only speaker is beside it. the volume rocker and lock for screen rotation on the case's right. 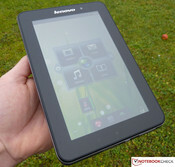 has the Lenovo App Shop and a navigation software installed. and the YouTube app plays HD videos. Handy size and low weight at a good price-performance ratio. In our opinion, the Sony Tablet P/S because of the ease of handling on the Android side. The Dell Streak 7" is also handy, but doesn't have a viewing angle strong screen. The HTC Flyer 7" WiFi +3G excels with Access Point function and Magic Stick for perfect stylus inputs. Last but not least, the Galaxy Tab 7".